It’s Give Away time here on Ninja Mom Designs!!!! You all are such amazing readers and fans. I have hit ANOTHER milestone!! Over 500 likes on Facebook and Over 1000 Blog Subscribers. This calls for a celebration! I am in no way affiliated with Me and My Big Ideas. I just REALLY like their products. 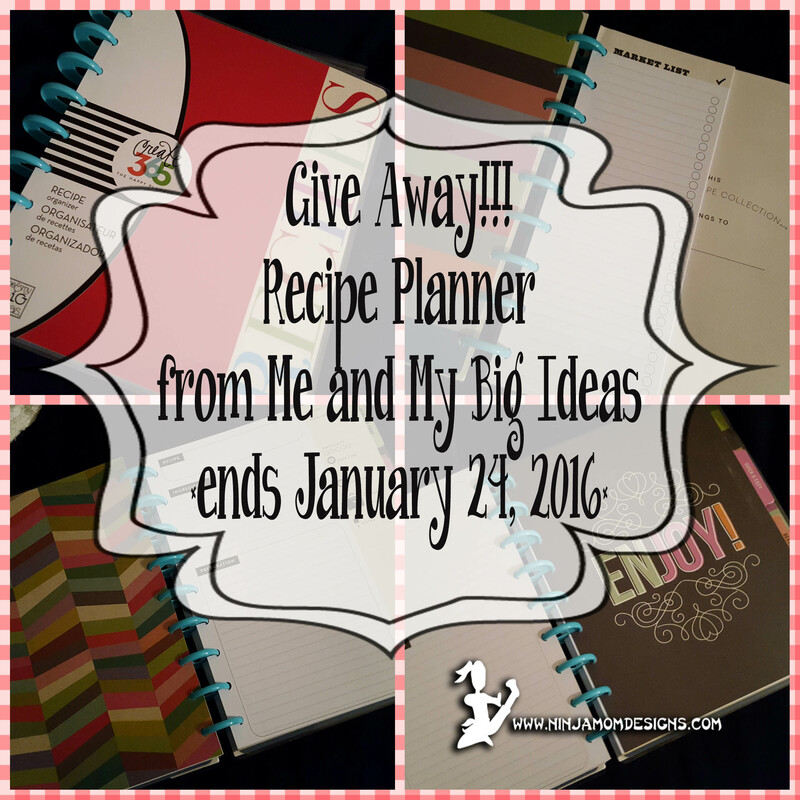 I acquired this fantastic Recipe Planner and am just itching to give it to one of you. 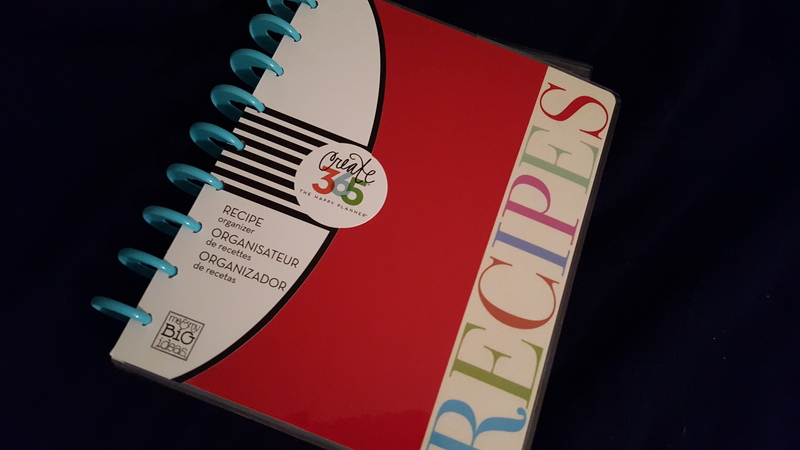 This recipe planner is the one with the red cover… not the green cover that comes with the kit. 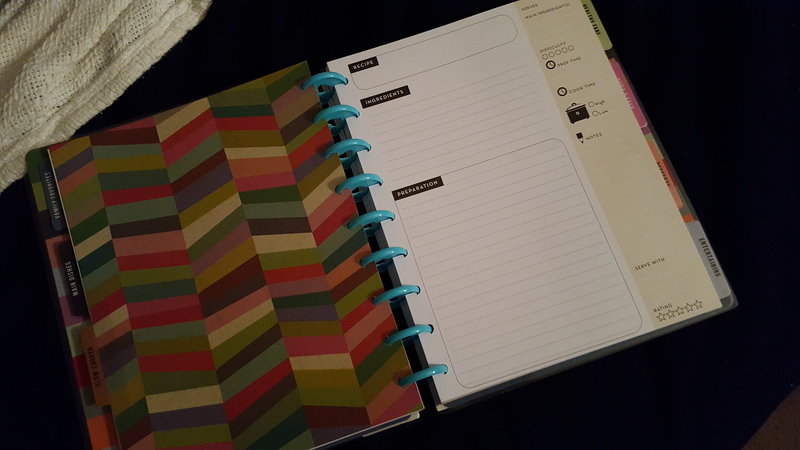 This planner works with the arc system- meaning the pages are punched in such a way that you can easily remove them. Why would you want to do that??? Well… if you don’t like the section you picked for a recipe… simply take it out and move it! If you want to alphabetize after recording some recipes… no problem! 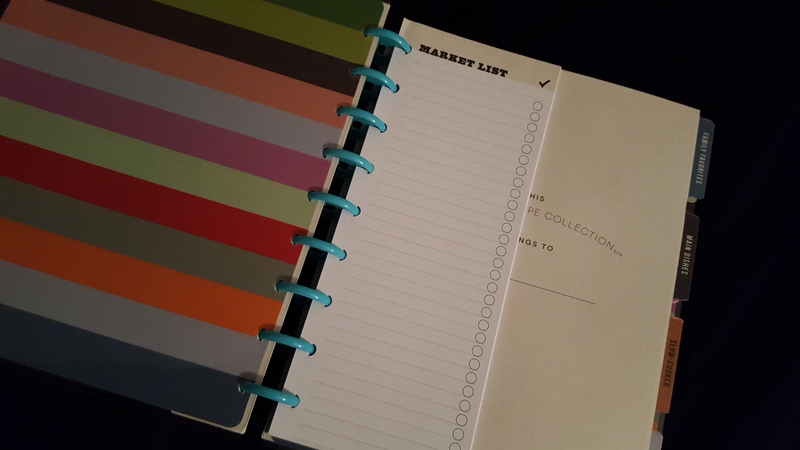 This particular planner comes with a shopping list that is also punched to fit the planner rings. 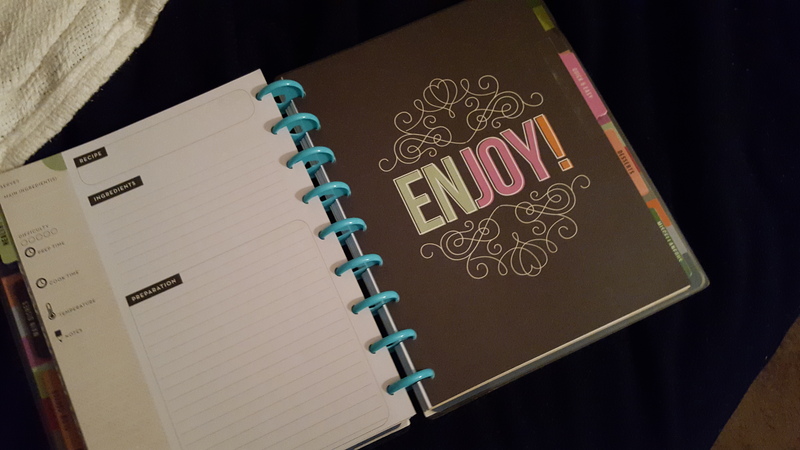 The planner is divided up into several sections. Each one has a beautiful, decorative page insert. Some of the sections include family favorites, main dishes, slow-cooker, entertainment, misc, and more. 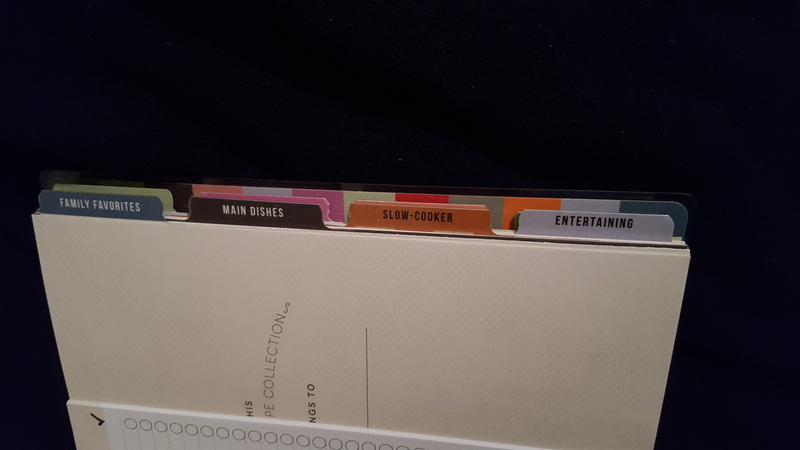 I personally wanted to customize my sections- I took coordinating washi tape and covered the original wording, used a sharpie, and wrote in my own. The recipe pages themselves have plenty of room for recording your special recipes. You can make notes, record prep time and cook time, and decorate to your heart’s content. 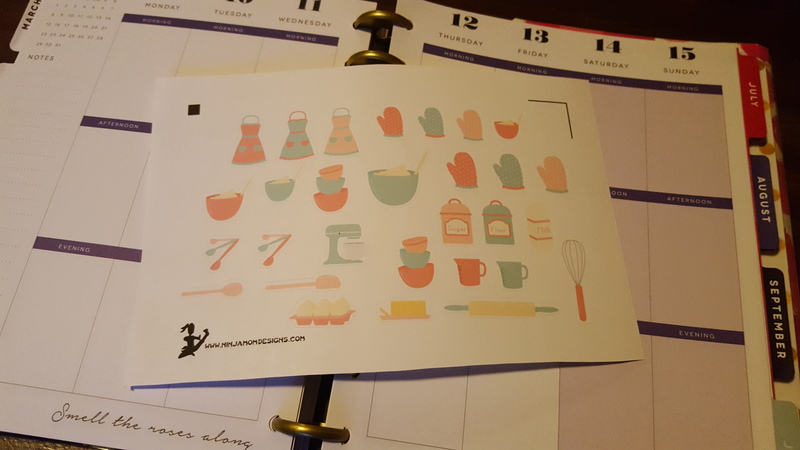 Included in this giveaway is a set of custom kitchen themed stickers, made by me with images from the Hungry JPEG. How do you enter to win???? Follow the instructions on the RaffleCopter below to enter to win! Chicken with sundried tomato cream sauce and basil! I would definitely put my sweet and sour meatballs in first!!! My twin boys favorite, arroz con gandules. I’m a baker so Chewy Chocolate Chip Cookies! My buffalo chicken potato casserole recipe. First entry would be chicken noodle soup. My 1st entry would be my mom’s’ pasta salad! Green Chile Chicken. Congratulations and thanks for the opportunity to win. pound cake was the first recipe I put in mine! Butternut and quinoa soup would be my first entry. Avocado chicken, my families fav dish! I would add a family favorite, Apple Crisp, made from my grandmothers cookbook recipe! Then I would add an old family recipe of old fashioned Cheesecake! Thank you for all you do!! I so enjoy your printables! I would love to have this for my son who wants to start culinary school. The first recipe I will place is this is definitely cauliflower “hot wings” which are my FAVORITE!!! <3 Thanks for the opportunity to win this! I love to use my crock pot, so the first recipe I put in my planner is a crock pot lasagna!!!! Chicken and sausage stoup.. yes STOUP. Jamie Oliver rost chicken ! Crock pot chili like my dad makes it. I LOVE white chicken chili! My first recipe will be Coca-Cola Pork Roast….YUM!!! I just found your blog via Pinterest and love it! I am new to planning and enhancing planners and the works. The learning curve is a little high for me, I have been a go to Wal-mart buy a planner get a pen a write. This way is much more fun! I would put Carmelita Bars recipe in mine!! The first recipe I would put in it is a recipe that my family cooks every new years eve to start of the New Year and it is called pepper pot. My pleasure. It’s fun for me.